Warning :the method presented in this article are too old to be applied now. Use this information at your own risk. I use a Linux Mint system on my workstation ( Linux Mint 10 , equal to Ubuntu 10.10 maverick ). To install the same software I use ; all you will need is to copy and paste the lines of codes under into a terminal windows ( Ctrl + C here , and Ctrl + Maj + V in the terminal ). I advice you to do it line by line, and I hope everything will get installed "automagically" as it is for me. update summer 2011 : This works also in linuxmint 11 , equal almost to a Ubuntu 11.04 in gnome classic mode. Info : this GPS install will overwrite all your previous Gimp folder of preferences. my brush V4 kit is in the master Git of MyPaint by default. Note B : I can't find a way to write a clean way of how to install Krita with less than 10 lines of codes ( in terminal , as above ). If some of you knows how to do it, please write it in the comments ; else you can check this thread on the Krita forum. Updates : I correct here and there littles errors, sorry if you tried it and it didn't worked, my fault ( err1 : typo in sudo "apt-add-repository" corrected / err2 : to update Mypaint, I forgot to enter in the folder Mypaint ; corrected ) . Updates 2 : another typo in gimp-plugin-registery corrected, sorry if you had the error of the missing package 'gimp-plugin-registery' . License: CC-BY David Revoy, www.davidrevoy.com, 22 april 2011 . Dude. This is so helpful, now I can prep for Blend & Paint!!! @jikz : Cool :) I in fact gathered this information for the Blend&Paint DVD documentation at first. Perfect to got the apps with the last features. @jogai : I'm seducted by the idea , but I'm sure it's complex to do ( maintain a ppa ). Be sure I will let my curiosity google for informations about how to create and maintain a ppa, maybe it's simple ? Hello! This is awesome! Very important for beginners like me XD. I'm always reading your blog, because I like how you work only with free softwares and make this beatiful and impressive things. But I've one question: Recently, I got an Intuos4 tablet. I tried to configure in Linux Mint 10 but it doesn't "work". The pressure was ok, but the ExpressPanel(the shortcut) not. The LEDs didn't turn on. How can I make it work? I'm very very new in Linux and all this softwares you use. I think Gimp 2.7 has very interesting improvements respect than 2.6 (I think I'll try it soon). Do you know if GPS and plugins has problem installing Gimp 2.7? @Gabri: Sure, improvements of 2.7x series (2.8?) are really good ; but for digital painting , 2.6 is still ahead with the mixbrush tool and ability of color bleeding and texture embedded in stroke. Unfortunately, GPS 1.5 presets are compatible with the 2.6 series only. I tried to run this script ( Preset Converter ) ;:http://wiki.gimp.org/index.php/Mindstorm:Preset_converter , but it was buggy here, and just make a script who froze the terminal windows. Currently the mypaint git master branch appears to require a gtk library to run - It compiles fine, but gives troubles when trying to run it. Any idea how to install this GTK library? I've tried, but I seem to always land in dependency hell. @Sean Olson : I just tried here to compile on my system the fresh Git build without having no new librairy to install and all ran ok. I have a Linux Mint similar to Maverick Meerkat, gnome edition. I think you have another system ? If yes, repport to the Mypaint bug trackers, or go on #Mypaint Irc channel on the Freenode server ; Mypaint experts are around this channel and can answer to your question better than I can. Thank you so much for this information. 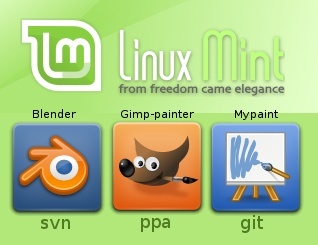 I am new to Linux Mint (and Linux period ;) ) and I could not get the latest version of MyPaint to install. You've helped this newbie out a great deal! Hi David and thank's for your awsome works and this helpfull guide. Unfortunately I've some problem with gimp, the mix brush tool in particular. When I use it with low opacity, white vertical lines appears at the same distance each other. It's weird because this lines appear only with this tool and not when I use the simple brush with the same settings of opacity. It's like a strange white grid. @Alessandro : Hi, From what I think, this is not a 'real' bug : the mixbrush allow the engine to embed a texture ( windows > dockable dialog > Pattern ). The pattern selected by default may be is a grid or something similar ; try to select another pattern and watch the result. Yes, it was the texture, oh gosh! Now I have another trouble, when I enabled the screen mode for the wacom input device, sometimes the cursor shape of the brush freezes on the canvas and I can't use or doing anything else until I click again on the canvas. This issue is only for gimp, because in mypaint the device works great. I'm sorry for the inconvenience, I hope not to bother you. @Alessandro : Cool it was about texture only. For the 'freeze' This is a known problem with Gimp related to performance. It's normally happen when you start a stroke at the moment another one is still computing. Because some brush are slow, you have to wait for there completion to start a new stroke. On a good computer even , this is a nightmare. Krita is much faster but still a bit hard to install/compile from the source. The good solution is of course Mypaint ; I worked all Sintel illustration on a laptop , painting with Mypaint ( good performance ) and using gimp for manipulation operation. Unfortunately I LOVE mixbrush and Gpen, I can't live without. Maybe I've fixed it, maybe not, cause is not a real fix, but works for me. I've set only the stylus wacom as input device, not ereaser or cursor (yes, in this way when I touch the mouse the cursor changes, but I can live with that) and before painting I click on top bar of the canvas window, as for select the window as active. After that, the 'freeze' issues seems not to be. I don't know if is a real fix or is only a strange reaction of my computer, however I've a quad core Q6600 with 4 gb of ram. Anyway sorry to have clogged your blog, and thanks for your help and your information. Hey David, I think the problem with me using linux is the lack of hardware compatibility, maybe I should buy a ubuntu certified laptop. I was using linuxmint, using mypaint, gimp and alchemy before I discover you, I'm glad I found you, because of you I discover Krita XD, I hope they improve the compatibility with future linux versions. I'm using asus laptop with i5 core, 8gb of ram, intel graphics sharing the video with the physic ram. So, I'm planning to buy a Dell ubuntu certified one in the future, because I cant run ffmpeg smoothly, I'm a screencaster so thats a problem, by the time I'm gonna stick with Windows until this kind of problems are resolve, I remember you tell me that digital painting is obscure this days, but is going to change in the future, I have pure faith in that. I'm a little bit worried about the industrys standards, if I get to lovely with gimp, if I get a job and one of the things is to use photoshop only, only photoshop, that might be a problem? Or the industry they really don't care about that? those are a couple of things I'm hearing from people, like about 3d, the industry standard is maya, buy I'm so attach to blender, is my main tool for 3d, I really cant use maya, ammm, (I really hate it XD). Anyway, like always thanks for the help David ;) . @Giovanny ARce : Hi, here I consider the real industry standard is 'quality'. In fact no studio or no workflow can prefer a file format or a software over a quality. My publisher or studios here don't mind witch software I use, because they purchase my style and the quality of finished 2D graphics ready to print. I think it can be the same for a good modeler who can do only *.obj ...etc... if the quality is really cool , no one complain and other adapts. But here I also experienced trouble last times ; I had to re-open my licence of Photoshop running with wine lastly for one of my project : With open sources software you can't actually do CMYK layered files. CMYKTools can do flat Tiff as well as Krita. So, I have big hope into one Gsoc of this year of the Krita team about the *.psd file format. Because this one is really became a standard. So for my last project , I had to batch convert 65 xcf files soft-proofed RGB to 65 PSD RGB with a hack I did of the David's-Batch-Converter plugin for Gimp to save layered PSD. Then create a Photoshop script to convert all PSD RGB to PSD CMYK. Thanks to softproofing, all my color were inside the gamut and no surprise. ( make me think I have to blog post about this may be ) . So, yep still a bit obscure time, Krita's + Mypaint gonna change it ( next Gimp is also looking awesome ). merci beaucoup pour ta maniere de partager tout ce beau travail. Grace a toi, j'ai finalement eu le courage de quitter Windows et d'adopter linux (mint). Depuis presque 8 ans j'ai essaye de quitter windows, mais a chaque fois, c'etait a cause du fait que j'utilise (de temps en temps) mon wacom pour dessiner, et que sur redhat et puis sur opensuse, je n'arrivais pas a faire marcher la tablette graphique. Mais en voyant ton travail sur le site de blender, j'ai finalement fait le saut. Depuis moins d'un an je travail presque exclusivement sur mint (j'ecris meme ma these de doctorant sur lyx), ton travail est d'une grande inspiration. La plus belle des trouvailles est pour moi, alchemy que j'ai decouvert, encore une fois, grace a ton site et ton travail. J'habite l'ile Maurice et j'espere qu'on pourra peut-etre collaborer sur quelque chose, ou bien meme t'inviter pour quelques jours a l'ecole des beaux arts ici. I'm sorry for being such a noob, I do my best to improve my understanding... I did as the instruction said... and I faces some questions, hope that's fine with you that I ask them here. I'm pretty new to Terminal and I didn't understand how some of the lines should be dune... I try to install MyPaint. First, what should I write after the 'cd' command in the 1st square? Second, what source should I type after the 'mkdir' command in 'source-to-compile'? I tried Desktop, I believed this isn't it- should it be usr? Third, is the second square an update to the 1ts one? If so, what does it replace? @Shay Li : Sorry , I missed answering your comment by the past, surely a notification failure. For your questions : - Just select the code line one by one on your browser ( Konqueror/ Firefox / Chromium , etc ), then press Ctrl + C , to copy them. - In a terminal windows, click next to the prompter to focus the mouse over the terminal windows, and click Ctrl+Shift+V , to paste the line.- Then press enter. Redo this for each lines.